Birds are widely recognized as environmental barometers. Given their wide ranges, fast metabolism and high energy requirements, they respond more rapidly than most living things to changes in the environment. Thus, variations in the populations of bird species provide important signals of environmental well-being. This reality is the foundation of the Center’s work. The fact is… people only care about things they understand. 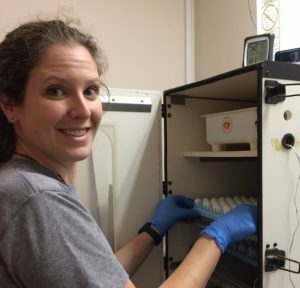 Research explores the unknowns of biology. Conservation preserves the diversity around us. But in order to engage the public in the importance of the Research and Conservation mission of the Sutton Center… EDUCATION is vital! 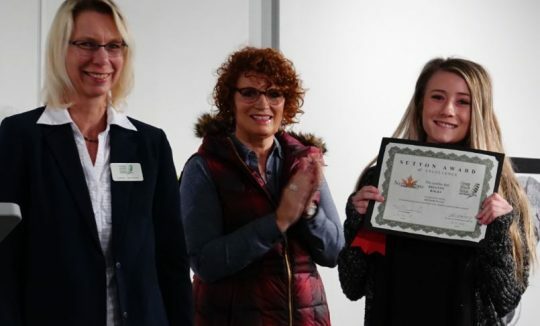 Sutton Award – A statewide art competition inviting high school students to tell the conservation story through art and essay. The Sutton Award is free to enter and open to all Oklahoma high school students grades 10-12. Click HERE for details, forms and to learn more from past winners and their teachers. Sutton Award ceremony where student art contest winners are recognized. Live Bird Education – The It’s All About Birds! 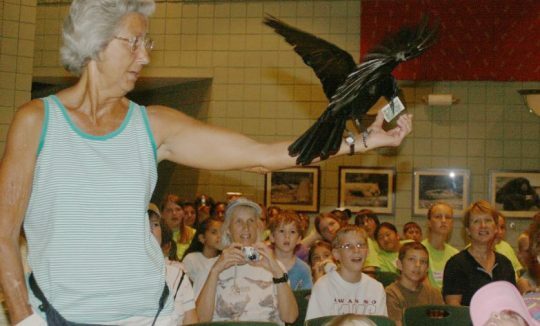 program served Oklahoma for 10 years by offering a free-flying bird show that traveled to venues across Oklahoma to educate students and the public about the value and wonder of birds. We are currently working to rebuild an outreach program complete with trained educational birds. Click HERE to learn more about what’s coming! The Sutton Center’s It’s All About Birds program wowed and informed audiences across Oklahoma for 10 years. Conservation Internships – In our highly rated internship program, high school and college students work alongside our professional staff on real projects and play a role in wildlife conservation. Click HERE for details and to hear more about our internship program. 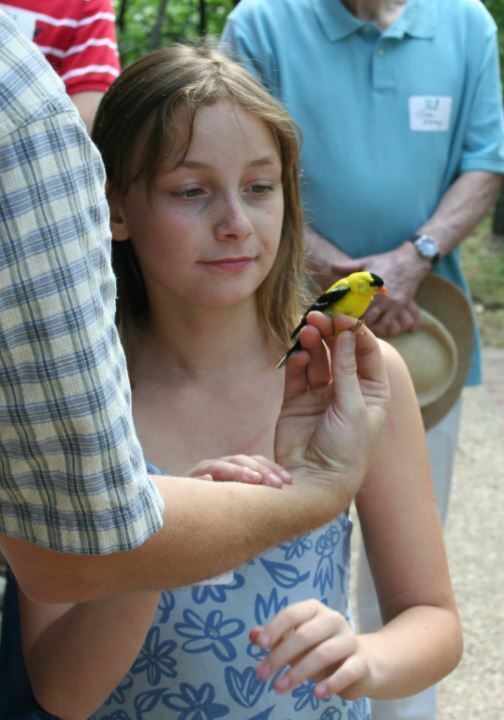 Hands-on experience with studying and conserving birds is available through the Sutton Center. Get the Lead Out! 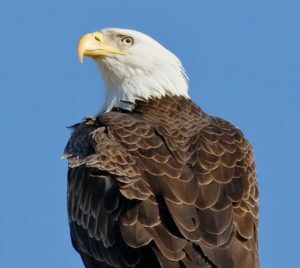 – Lead poisoning is one of the leading causes of death in eagles and other raptors. To schedule a shooting demonstration, watch videos or to learn more about what you as a hunter can do, click HERE. 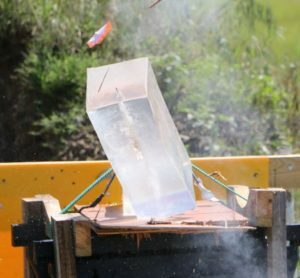 Shooting demonstrations such as this one with ballistic gelatin illustrate how eagles become unintentionally poisoned by lead, and show how to easily solve that problem. Unintentional lead poisoning is a significant and easily preventable problem for Bald Eagles. A close-up look at an American Goldfinch can make the need for conservation tangible in young and old alike.